It is time I gave you an update on Bella and the kittens. First…..Bella. She went to both the vet for her annual checkup and to the groomer last week, so for her, it was a great week. She weighed in at 93 pounds! The vet said she was a healthy girl and at the perfect weight. It was a very hot day and she enjoyed plopping down on the cool, tile floor at the office. A few days later she spent the day at her grooming appointment. She seemed to enjoy that day as well, another hot day spent inside. When she got home she looked and smelled so nice that she got to spend an hour or so in the air conditioning with me. And the 3 kittens……wow have they grown! They are 4 weeks old now. In a couple of weeks I will be looking for a good home for them. Are they not the cutest things you have ever seen??? Bella was delivered to us on Valentine’s night, 2014 and our hearts have been hers ever since. 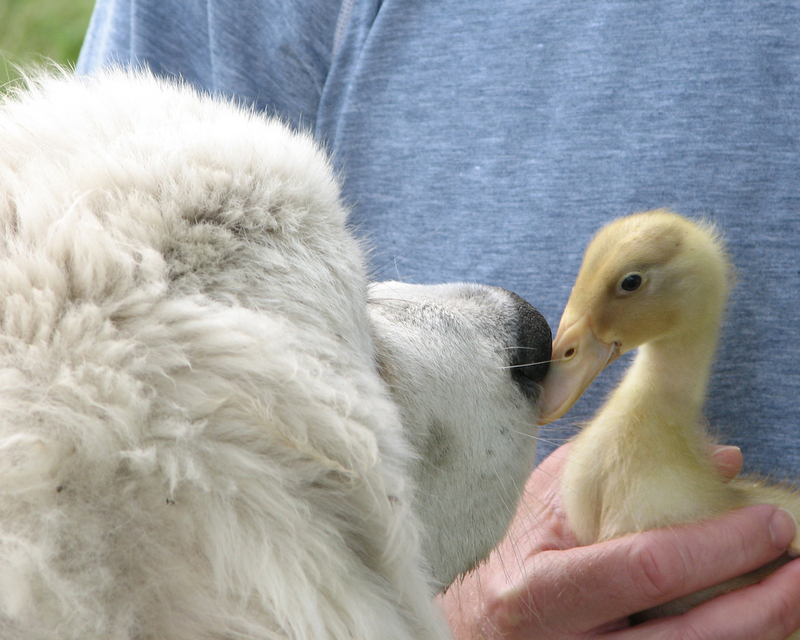 We had lost Balto in November the year before and it was just not the same without one of these big, white, beautiful, loyal Great Pyrenees dogs on our farm. She was 10 weeks old when she arrived and nothing but a big, squirmy ball of fur. She moved and wiggled around so fast that it was almost impossible to get a decent picture of her. But as we have come to expect from these dogs, it didn’t take her long at all to become trusted among the alpacas, friends with the cats and to settle into her new home. 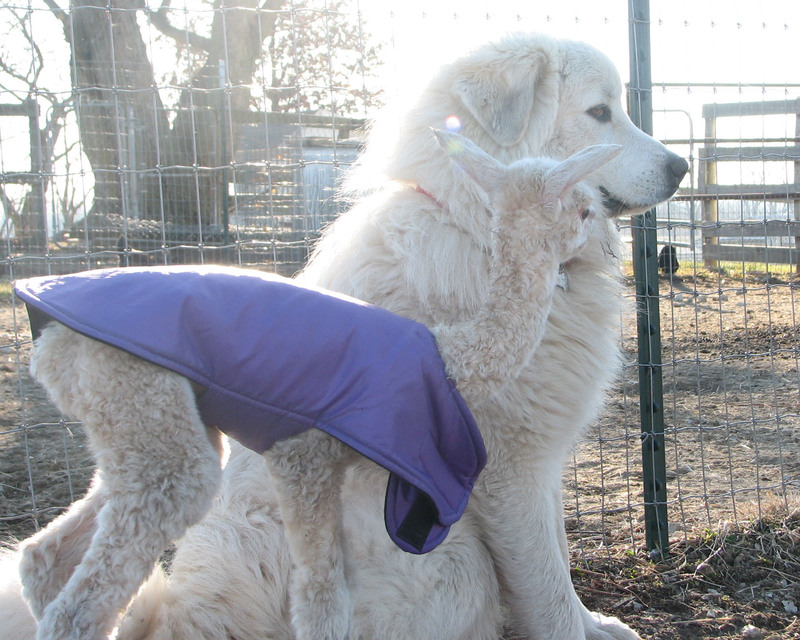 We get lots of questions about livestock guardian dogs so I thought I would introduce you to Bella by answering the most common questions. Here we go…..in the order of how often the questions are asked. 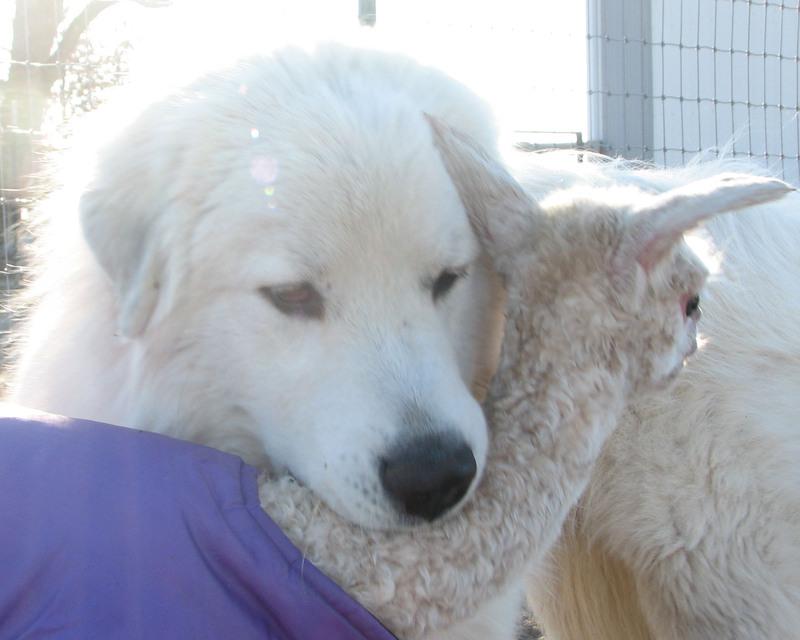 #1 most asked question – What does a livestock guardian dog (LGD) actually do? Bella’s most important job is to protect the alpacas. We keep her in the pasture with our females and crias to make sure that they stay safe. Our biggest predator problem is coyotes and while they have never bothered our alpacas, Bella makes sure that they don’t come close. She has a booming bark and sends them on their way pretty quickly. It is interesting to me that Balto and Bella had very different methods of sending the coyotes packing. Balto, who had a knack of getting out of the pasture any number of ways, would actually leave the pasture and chase them till they were off the property. Bella, alternates from running along the fence line and barking to trying to round up the alpacas for safety by herding them into the barn. She will run back and forth, between the alpacas and the fence, until the threat is gone. I think another very basic instinct that these guardian dogs have is the ability to show compassion and care for a sick, scared or newborn alpaca. I am in awe and brought to tears every time I see this happen. But I have seen it enough to know it is true. I have seen both Balto and Bella welcome a new cria. They sit back patiently to guard and watch at first but then, when Mom seems to be ok with it, they will sit or lie beside the young cria. I have seen Balto sleep beside a weanling the first night that he was without his mama and I have witnessed both Balto & Bella not leave a sick alpaca’s side until there was nothing else to be done. They are very protective and take their job extremely seriously. #2 most asked question – Does Bella really live in the barn? Where does she sleep? Doesn’t she get cold? Doesn’t she get hot? Bella lives in the barn with the alpacas. She spends all day in the barn and sleeps in the barn at night. This is the way it has always been for her. Her mama and papa lived in the barn and she was born in a barn, so that is all she has known. It is important for both her and us to know that she is with the alpacas to do her job. Bella has her own area in the barn, a place that the alpacas and donkeys cannot get to. Her bed is in this area and it is a place she can go to still be with and see the alpacas but have some space all her own. Bella has a very dense coat, particularly in the winter so she doesn’t seem to be cold at all. And you would be surprised how warm it is in the barn with all the animals and hay in there. When the weather is very cold or we are expecting ice, we will shut the doors at night to keep the wind and weather out and all the animals stay very comfortable. The hot humid days of summer are harder for her. She does get hot. We keep her groomed so that she stays as cool as possible. She drinks out of the automatic waterers that we have for the alpacas so she always has access to clean, cool water. She also has her own fan that she can lay in front of on hot days. It is back in her little private area of the barn so she doesn’t have to try to share with the alpacas. I will admit that we have let Bella in the house from time to time when it is really hot. She gets to come just inside the mudroom and lie on the cool tile floor. It doesn’t take her long at all to relax and rest in the cool house. 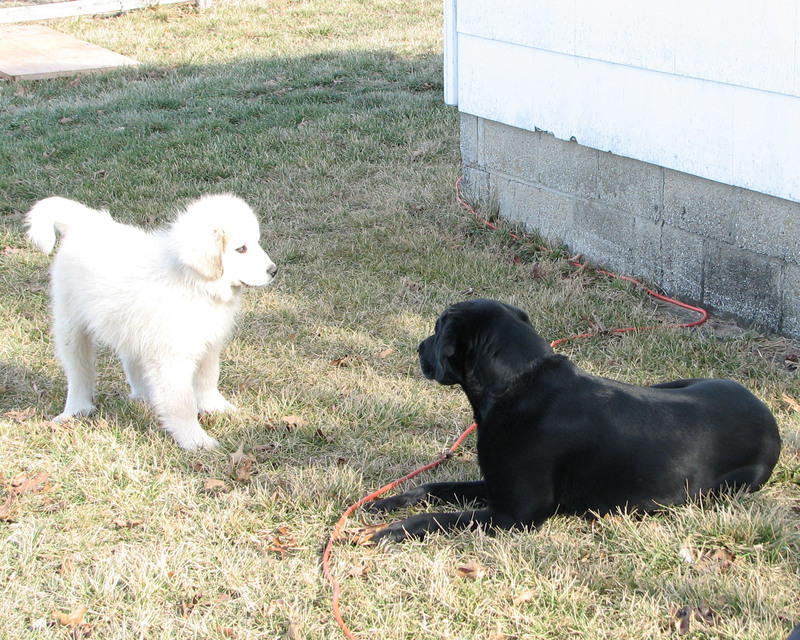 #3 most asked question – How hard is it to train a LGD? It’s easy…..they train themselves. It is instinct and in their nature to protect. 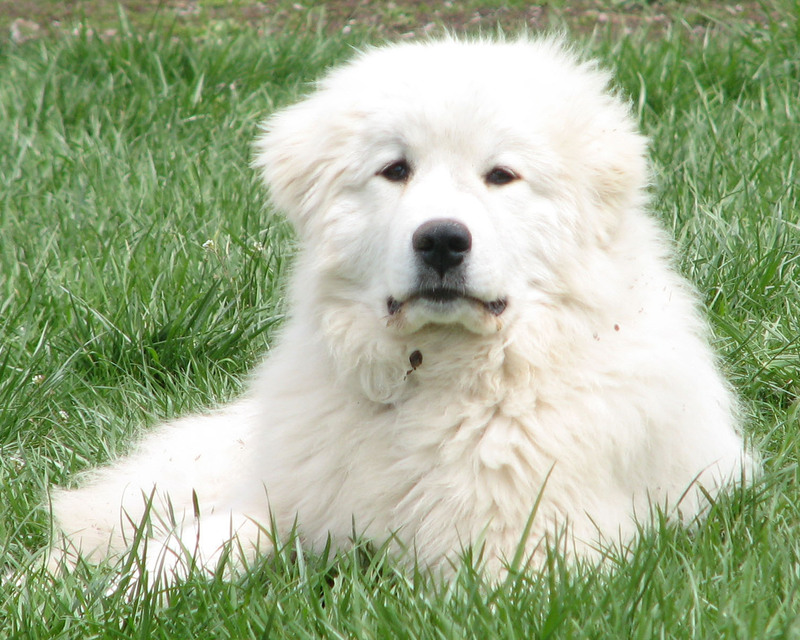 We have had 2 Great Pyrs since they were puppies and it has been fascinating to watch them go from the puppy stage to being an effective LGD. The first thing I noticed was that, even very young, they seem to have a sense about when to approach the other animals and when not to. They seem to figure out which alpacas don’t much care for them being around and which ones don’t seem to mind. They fit into their surroundings and get along with other animals very, very quickly. At first, the alpacas don’t seem crazy about having a puppy around, but they all very quickly learn to get along and trust each other. As they get older it is fun to watch them pick up more and more of the behaviors that will make them excellent LGDs. Of course, like any puppy, we have had to spend some time on basic puppy manners and obedience, but they are LGDs in their hearts and their guardian instincts seem to come naturally as they get older. #4 most asked question – What does Bella like? What does Bella dislike? Cucumbers – straight out of the garden is best, pulled right off the vine…..yummmm! Grooming – Believe it or not, Bella loves to go to the groomer and doesn’t seem to mind being brushed too much. There is a little bit of diva in her I think. Going to the vet – again, a little strange maybe. Bella, because of her size, is a huge hit at the vet and she certainly loves the attention she gets. She seems to love hearing the vet say what a pretty, big, healthy girl she is. And there always seems to be a few kids there to fawn over her too. Duck eggs – the fresher the better. The days that she can get to the duck eggs before we do is a good day! She seems to love it that the ducks lay their eggs on the ground where she can always get to them. Much easier for her to get than chicken eggs and they are bigger eggs to boot! Watermelon on a hot day! Moles – the word “dislike” might be a little mild. She hates moles. She will dig them up and kill them without a thought. She has literally saved our yard from being tunneled to death! Loud noises – she is terribly afraid of fireworks or cars backfiring. 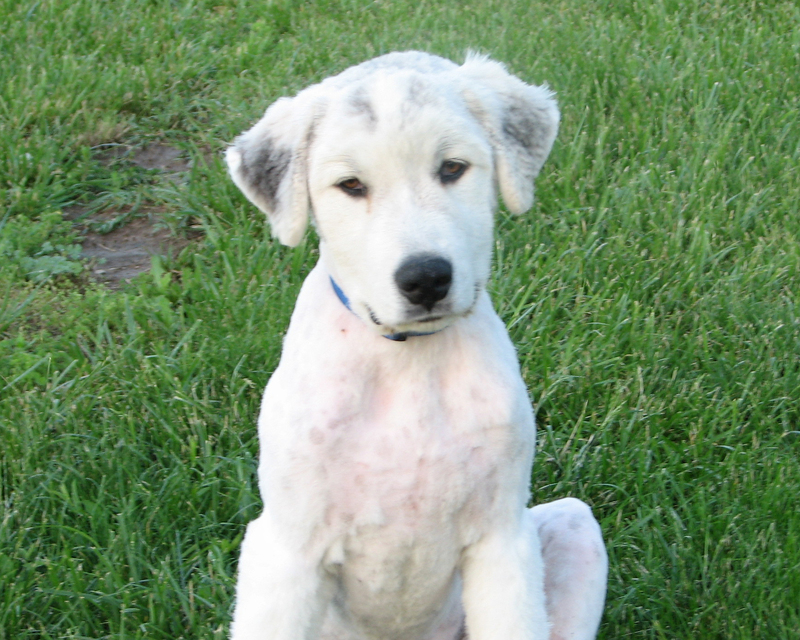 #5 most asked question – Does Bella ever get a bath? I think it is kind of funny that this is asked so much. I hate to think that she looks or smells that bad and I really don’t think she does. I tell people all the time that she doesn’t really ever get a bath. It just doesn’t do any good. She lives in the barn and honestly getting her wet just turns everything to mud anyway. She does love to get dirty though and many of our pictures are of one dirty dog. The only exception to this is when she is groomed. She seems to love getting bathed there and comes home smelling like lilacs or something I wonder is embarrassing for a barn dog but she seems to love it while it lasts. It’s the diva thing again. 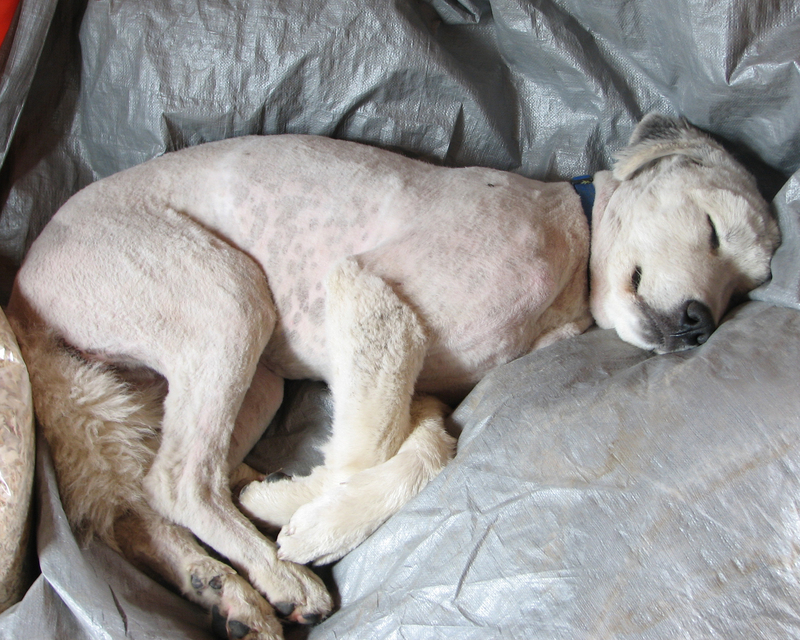 #6 most asked question – Every time I come down your driveway I see your LGD sound asleep. 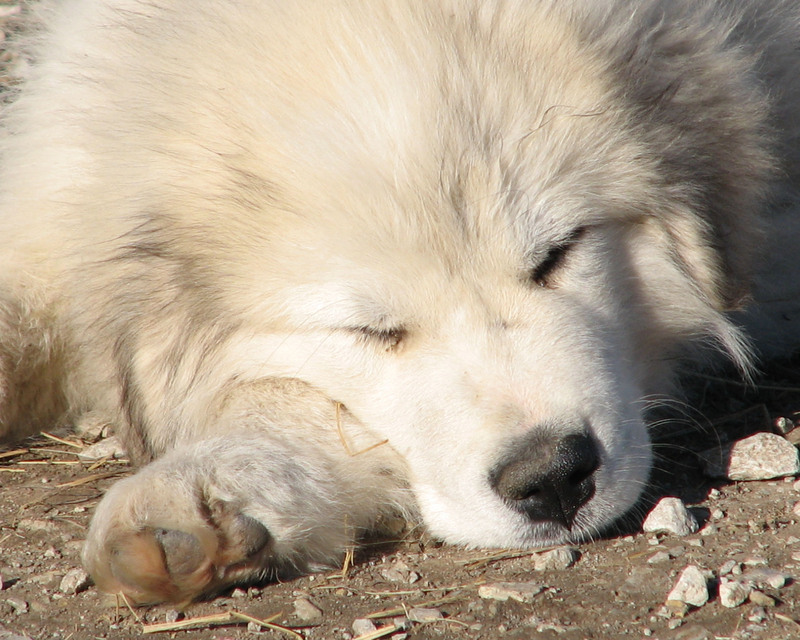 Are Great Pyrs lazy dogs? I think this is funny every time I hear it. I’m sure it seems that way but you have to remember that these working dogs are often up all night long. They work the night shift so to speak. That is when most of the action happens and they need to be on guard. It seems like they are very busy right at dusk and then again at dawn. Still, I will often get up in the middle of the night and hear Bella barking……doing her job. She doesn’t bark unnecessarily but there is just a lot going on in the dark. 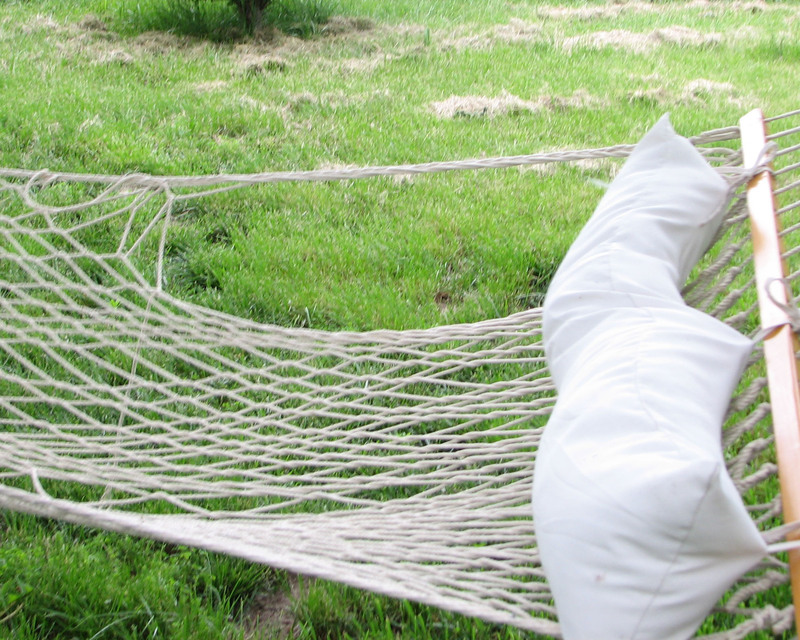 So wouldn’t you, if you had been up working all night, be more than ready to take a snooze in a nice patch of sunshine or shady spot when the notion hits? But trust me, even though she may look dead to the world when she is asleep, not a lot gets by her. So these are the questions we get asked most often. 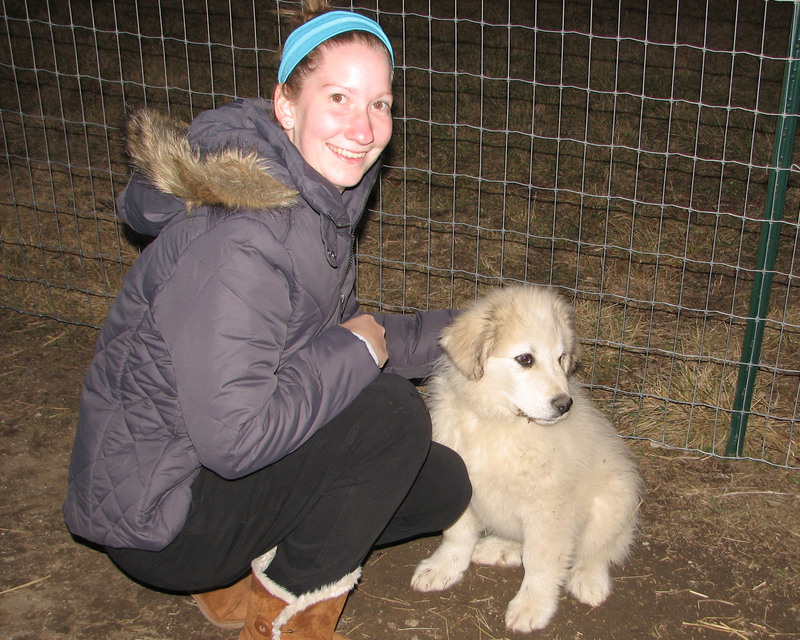 I hope you learned a little about livestock guardian dogs, Great Pyrenees, and of course Bella. We purchased both Balto and Bella from the Colemans with Wing and a Prayer Alpacas, Amity, Oregon and we cannot recommend them highly enough. Even though Bella is a working dog and spends most of her time with the alpacas, she is also a huge part of our family. If we are home and working outside, Bella is out of the pasture and right with us. She loves to take long walks, splash in the pond, go on car rides or just nap in the shade………as long as we are right there with her. It is such a comfort to know that she is taking care of things out in the pasture and ready 24/7 to guard and protect both the alpacas and us. We couldn’t love her more! 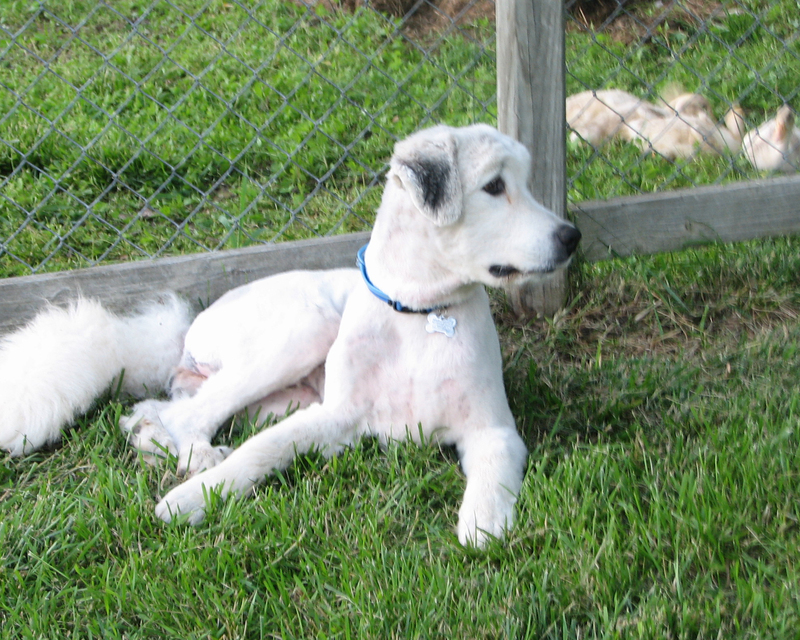 Balto, our Great Pry, desperately needed to go in for a grooming. 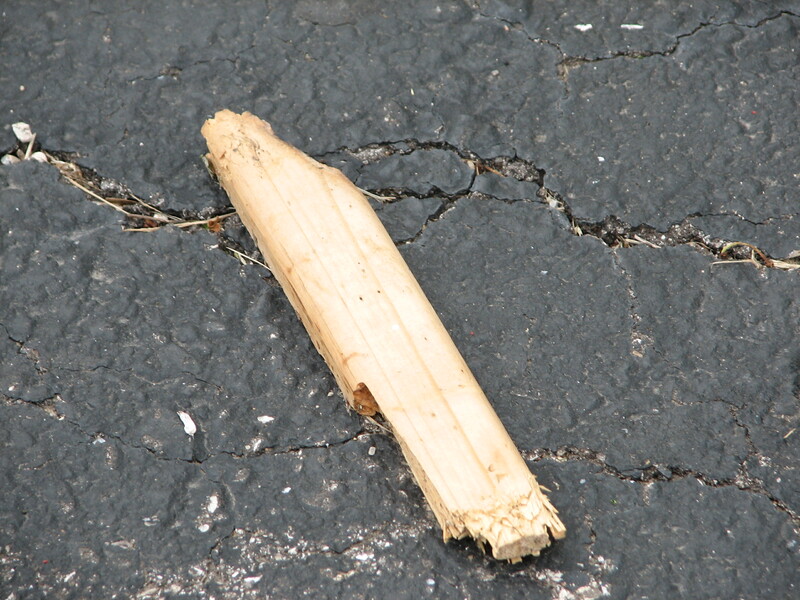 We have been having a relatively cool and wet spring so far, but even so, you could tell he was getting hot. So our vet recommended that we get all that hair off of him for the summer. Balto loves his farm, all his responsibilities, Shadow and the rest of the family. And he is a very agreeable dog……except when he has to go somewhere. He hates wearing a leash, getting in the car and he especially hates going to the vet. Even though we knew that it was not going to be a happy day for Balto, well, it had to be done. We dropped him off at the vet at 7:00 a.m. and it was a full day process for him. 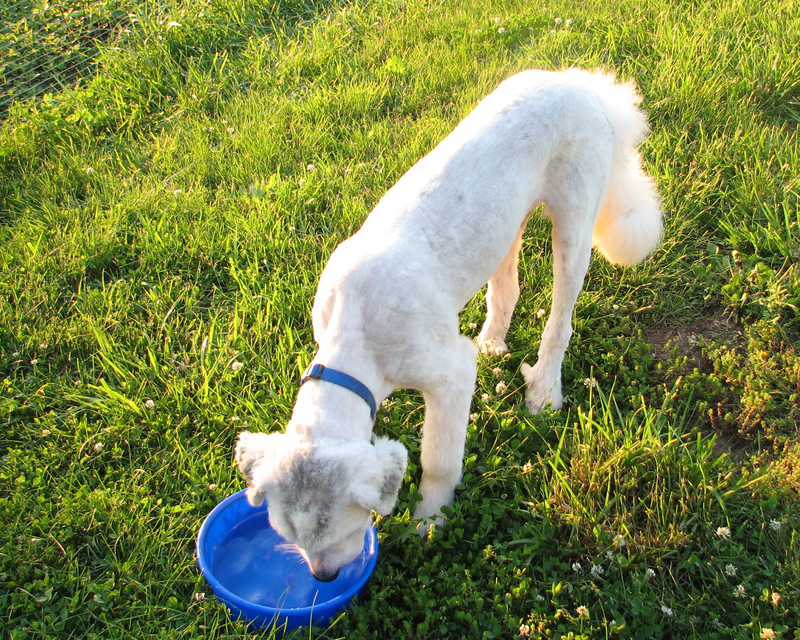 He was bathed, groomed, blown dry and finished off with a complimentary toenail clip. The very end of the day gave him the opportunity to have a quick check up with the vet and get caught up on all his shots. An all day spa treatment was what it was, and yet, Balto hated every minute of it! He clearly would have rather spent the day at the farm! When I arrived to pick him up he looked dejected, humiliated, and just plain exhausted from it all. And to add to his upset……he was totally unrecognizable! And needed a little relaxing time to just enjoy being home after his bad day! 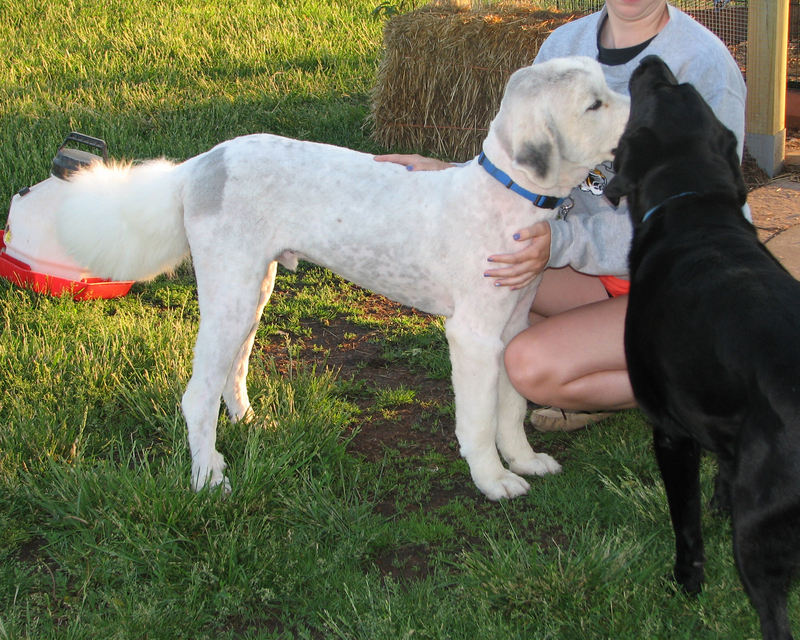 So tell me, does this look like the same dog to you??? 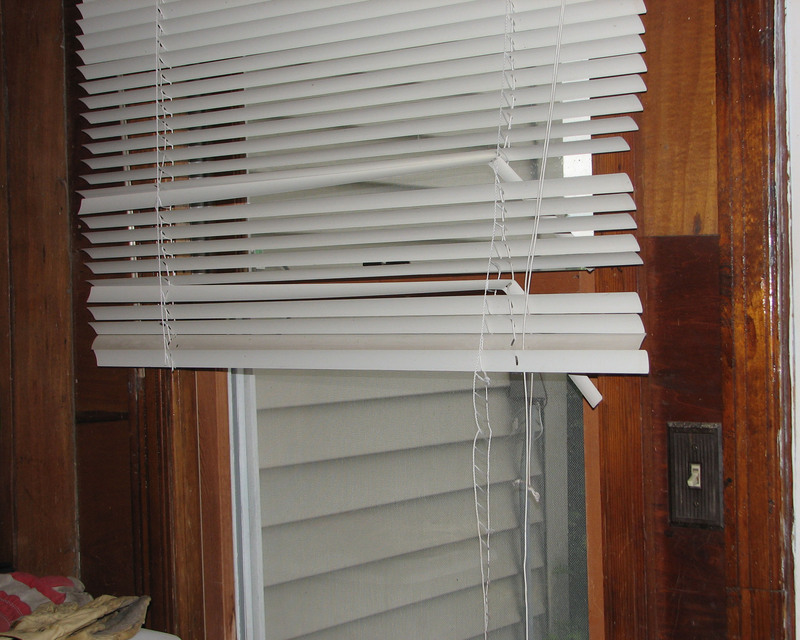 The mini blinds in the garage. These are the old metal ones, not plastic mind you. Balto actually didn’t feel well that day and the vet had suggested we keep him in the garage for the night. Imagine what he could have accomplished had he been feeling up to snuff! 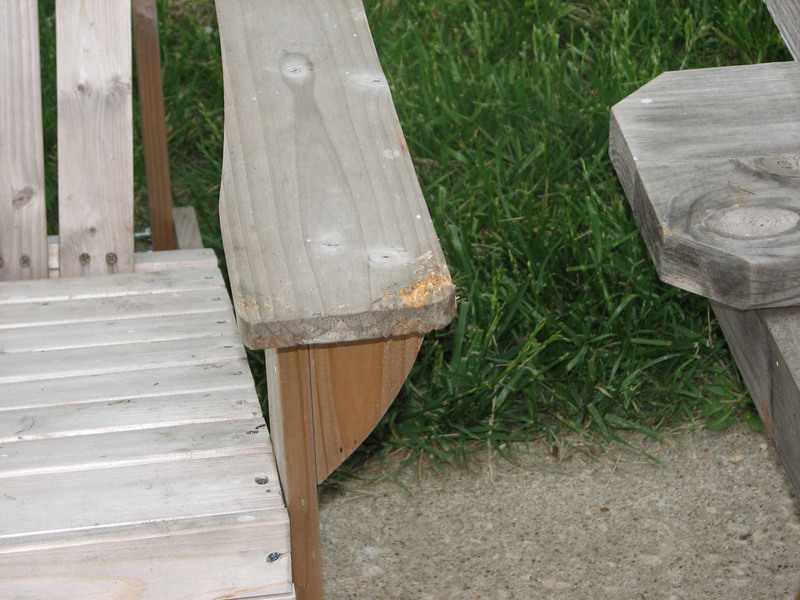 Has started to nibble his way up the arm of the adirondack chairs. Pretty much all of the garden stakes. Who knows what I have planted, and where now. 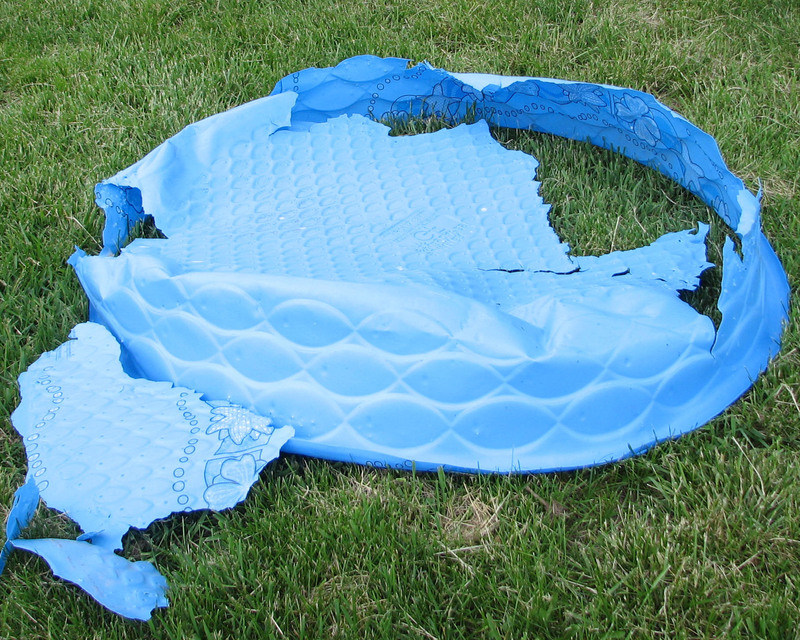 And the kiddie pool. Too bad this is the pool that Kellie fills up for him to take a dip and cool off. I’m sure there will be a few more things destroyed over the summer as Balto grows up a bit more…….but, with a face like this, one can forgive about anything! 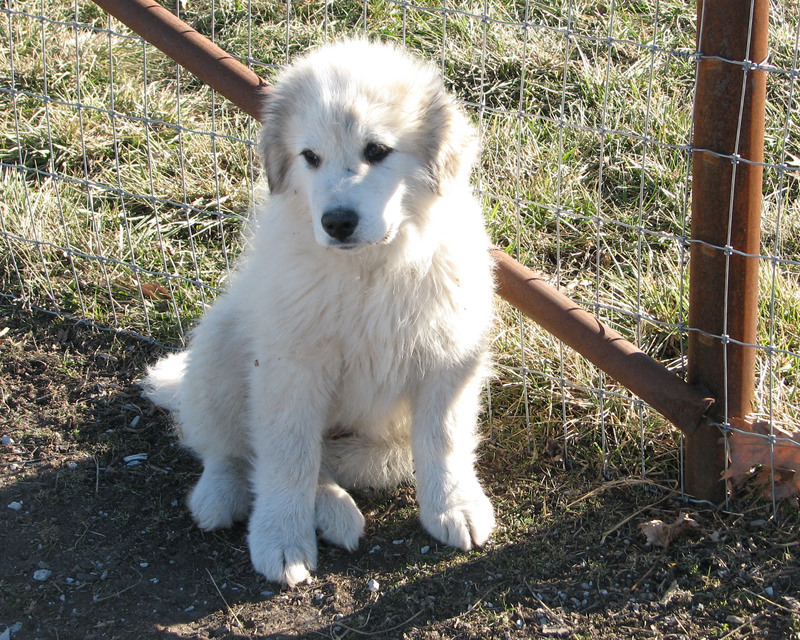 Our new livestock guardian dog, Balto arrived Thursday evening and we are all just head over heals in love with the little guy. 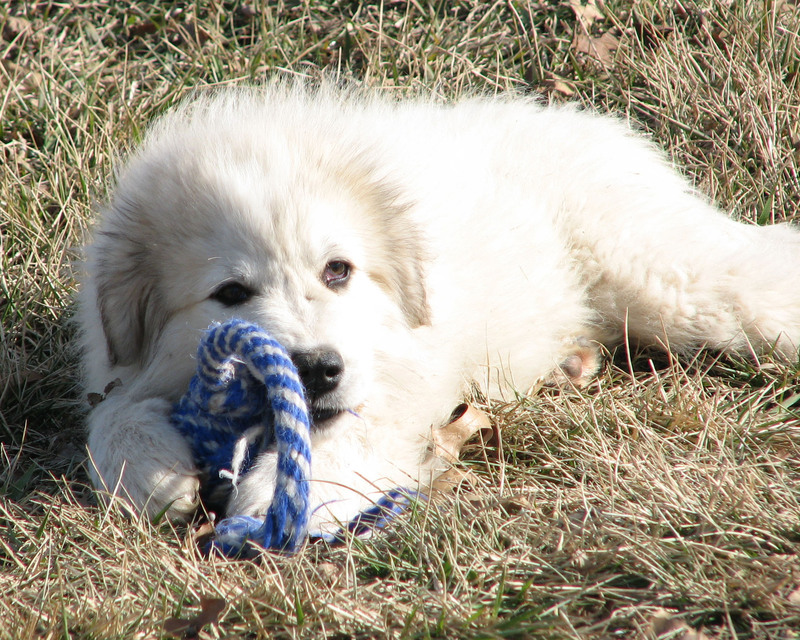 Balto is a Great Pyrenees and is a little over 3 months old. We purchased him from the Colemans, Wing and a Prayer Alpacas in Amity, Oregon. Balto was the runt of his litter but what he may be lacking in size he certainly makes up in heart! Balto is quite calm and is letting the alpacas and other animals on the farm warm up to him slowly. He and Shadow already get along famously. Even though Balto has a big job ahead of him, he is still a puppy and likes to play. Balto has been around alpacas since the day he was born. Our alpacas have not had a dog living with them before, but are warming up to him. Balto has been very good about letting the alpacas come up to him when they are ready to interact. But he is still a puppy and puppies get tuckered out from time to time. Sweet Dreams Balto.